I like celebrating Christmas with my pets. I enjoy dressing them up in ridiculous reindeer costumes and t-shirts. I like wrapping gifts for them and watching as Raynor tears through the wrapping paper to her toys and Teemo confusedly plays with the still wrapped gift. This take on the grasshopper is done for a reason and requires a bit of Katherine history. 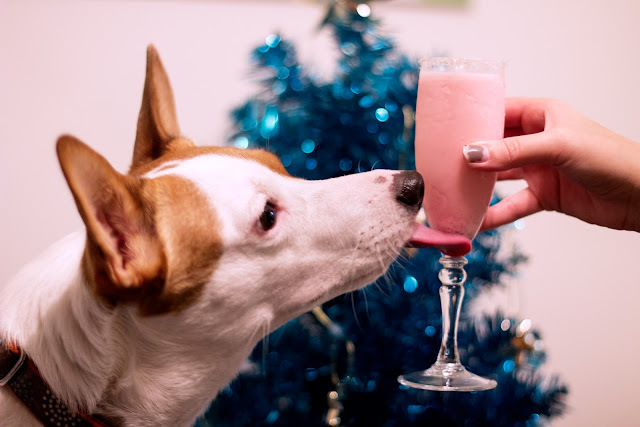 My sister always made these yummy mint drinks during the holidays, and younger maybe 12 year old Katherine didn't really get that alcohol should not be fed to dogs. We always gave her dog the bottom of the ice cream and yogurt bowls, so I gave him the bottom of this drink! Oops! So remember - don't actually give this to your pups like silly younger me did. Also, Teemo is trained decently enough to know he wasn't actually allowed to lick the drink and had to wait for the treat in my hand. 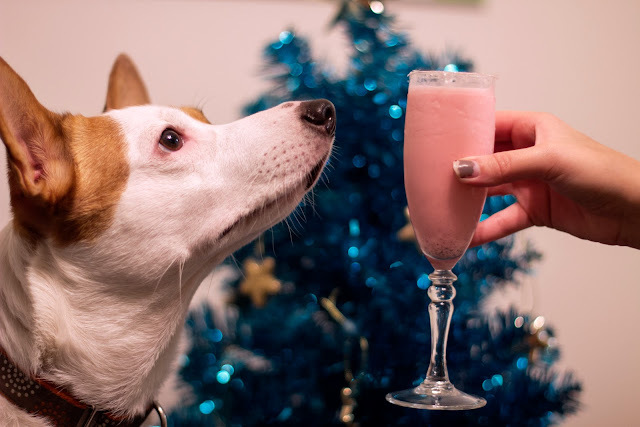 This is a bright and cheery cocktail to sip on Christmas eve while your pups anxiously await the arrival of Santa Paws. 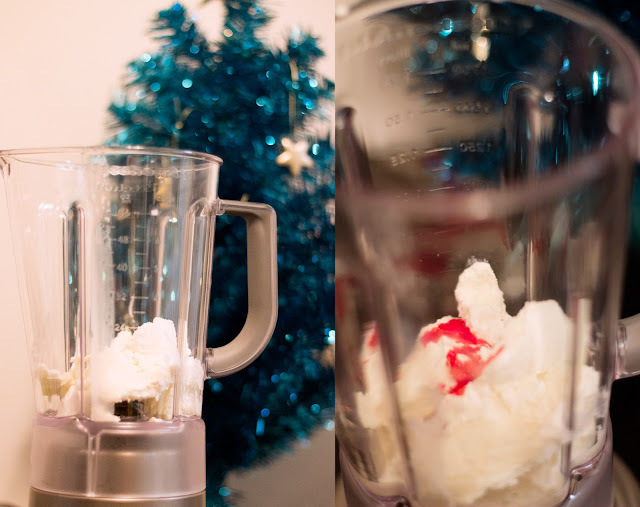 In a blender, put 4 large scoops of ice cream. 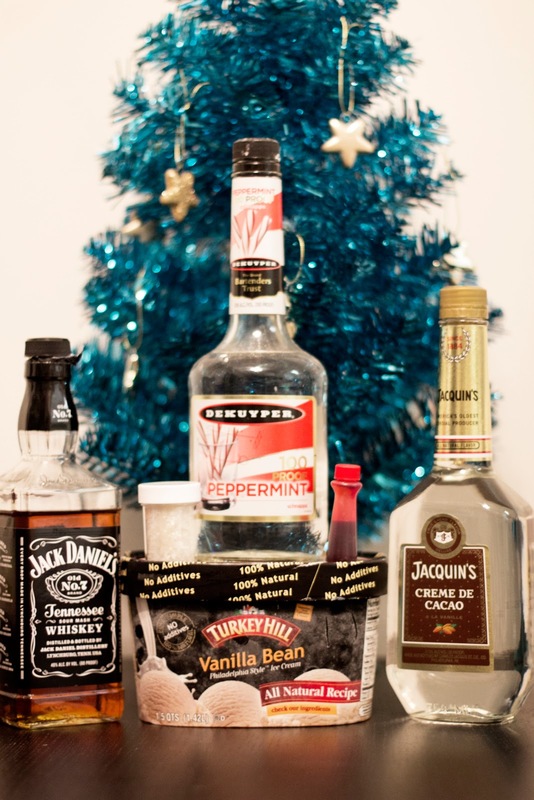 Add 1 shot of peppermint schnapps, 1 shot of creme de cacao, and 1/2 shot Jack Daniels. Add a few drops of red food coloring and blend. 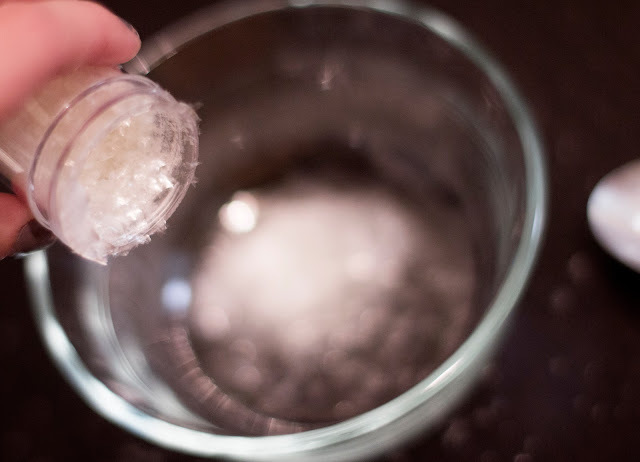 Dust a small plate with glitter sugar (available here) and wet the rim of a glass. 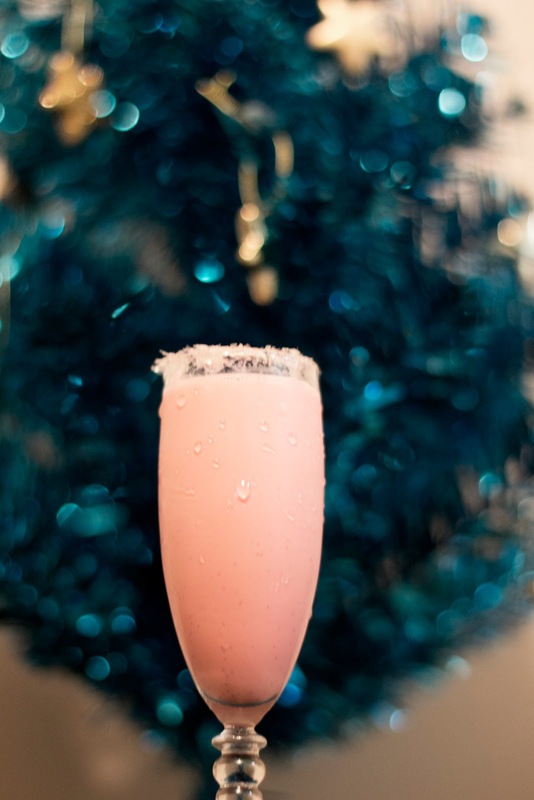 Dip the rim in the sugar for a festive accent. Sip and enjoy your pups, kitties, kids, or whatever it is that makes you happy! This sounds like a super tasty holiday drink that I'm going to have to try. Teemo is so adorable here, what a great pup! haha! I love that first picture. our english bully would never pose like that (she'd go straight for the stiff drink - she is 'english' after all). Aw how cute is that??? 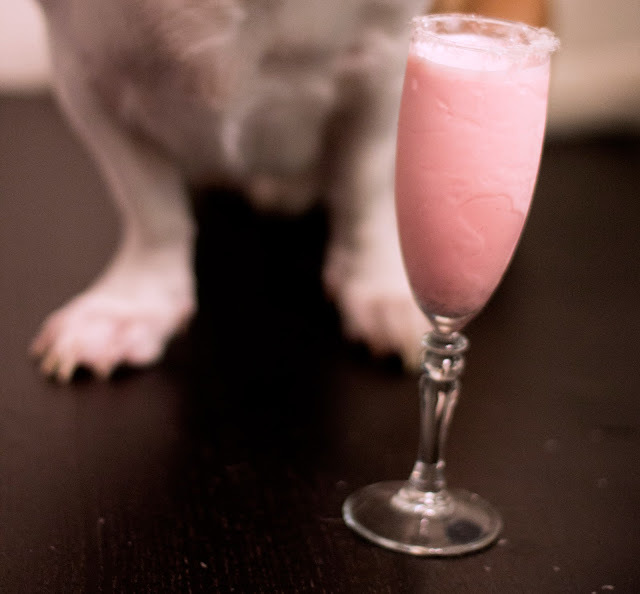 My 3 pups would love to lick these little mocktails! 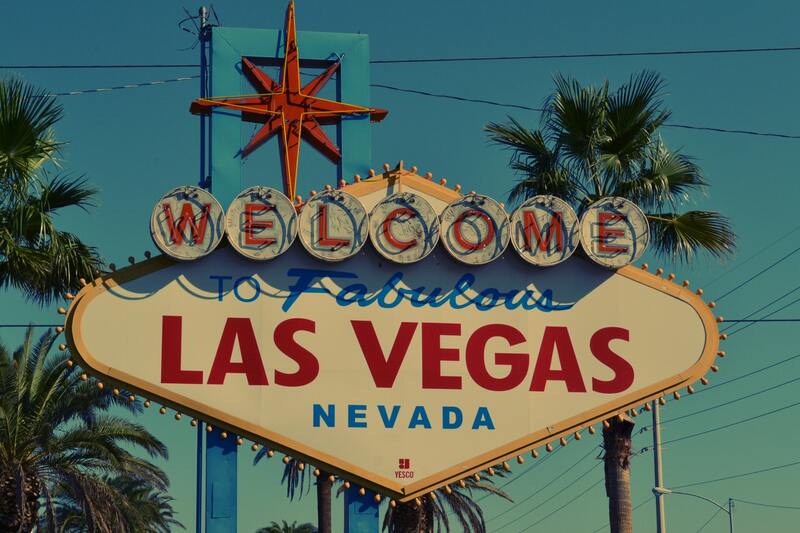 Perfect for them- festive and free! Yum! This looks super tasty and I love that it's dyed red instead of green. Such a cute idea. Hahaha....the last photo is just so funny! What a perfect capture. Oh my, this looks so delicious! If I wasn't pregnant I would be putting this on my list of things to do over the Christmas period. This looks so delicious and I'm going to have to try it! Great pictures too! Looks delicious! 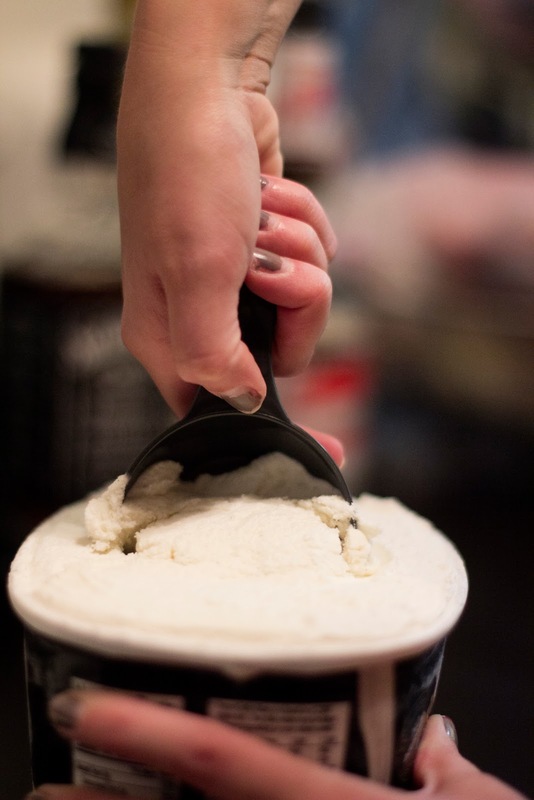 The pic of you scooping the ice cream! OMG. :) Love the lick~ Piri loves that too. Licking chilled glasses! I had to smile at the title of the post and drink though. I've been subbing in elementary level music class all week and we've been watching a movie called Santa Paws (well, I've been watching it five or six times, lol, since there's several different classes). That drink looks really pretty!